On a quite astonishing fourth morning of this Specsavers County Championship game, Lancashire lost their last eight wickets for 15 runs in 60 balls and crashed to a six-wicket defeat at the hands of newly promoted Nottinghamshire. Lancashire were eventually bowled out for 73 but there were times in the fourth innings of the game when it seemed that even 50 runs, rather than the mere ten they eventually set Notts, would have constituted a decent target. 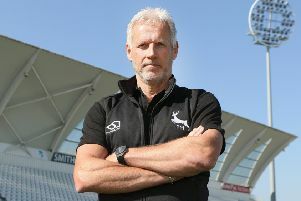 Head coach Peter Moores said:” Extraordinary is probably the right word for it. It was an outstanding hour of cricket by us. The quality of the bowling and the quality fo the catching was absolutely fantastic. I thought the way Harry Gurney set the tone; he’s bowled brilliantly all game; he’s held length and moved the ball both ways. “And Jake Ball did what Jake Ball can do – if he wanted to make a statement first game of the county championship then he’s done it with nine wickets in the game. “He bowled aggressively, he bowled at the stumps and he got his lengths right. Destroyer-in-chief was left-arm seamer Harry Gurney, who took six wickets in 30 balls and finished with six for 25 as Lancashire were bowled out for 73 in their second innings. Requiring ten to win, the visitors still managed to lose four wickets in the first 25 balls of their innings but Samit Patel and Riki Wessels calmed matters and completed their side’s win at 12.30 p.m. Helping Gurney to conjure this astounding victory was Jake Ball, who produced the delivery of the match to knock out Steven Croft’s off stump, but by then the Lancastrian collapse was well advanced. It had begun as early as the third ball of the morning when Keaton Jennings was leg before to Gurney for 27 and it continued in the next over when the left-arm seamer had Shivnarine Chanderpaul caught by Ross Taylor at slip for a duck to leave the home side on 62 for four. That began a procession which no batsman could halt against superb Nottinghamshire bowling. Liam Livingstone was caught at the wicket when attempting to drive a delivery from Jake Ball and Jordan Clark was caught at slip by Chris Nash off the same bowler for a duck. Dane Vilas’s six runs was a major innings but he was caught by Wessels off Ball. Gurney took the final two wickets to finish with match figures of eight for 43 while the deeply impressive Ball ended the innings with 4-14 and the game with nine for 57. Still the drama was not done with as rookie skipper Steven Mullaney was caught at long leg by Graham Onion off Joe Mennie, who also picked up the wickets of Jake Libby and Ross Taylor as the match accelerated towards its breakneck conclusion. Mennie finished with three for 4 (six for 50 in the game) but it was Nottinghamshire’s cricketers who left Old Trafford with the 20 points at the end of one of the most remarkable day’s cricket in which any of them will ever participate.